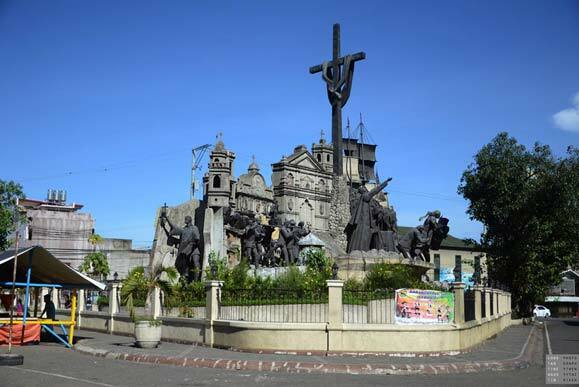 The Cross of Magellan is a popular historical landmark and tourist attraction in the middle of busy Magallanes Street. 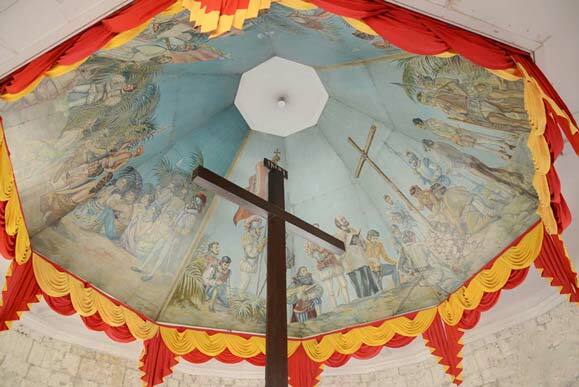 This important symbol of Cebu was said to have been planted by Magellan on April 14, 1521, when he baptized the first Christian Filipinos, Rajah Humabon and Queen Juana and about 400 followers of the Catholic faith. This was the residence of the first Catholic bishop of Cebu. 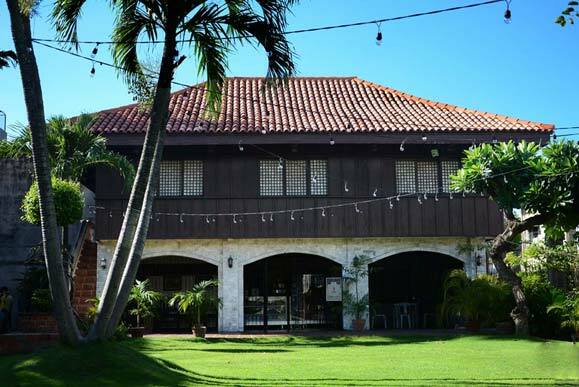 It showcases the Filipino history lifestyle between 1860 and 1920. It also displays an array of relics of the 18th century and collections of prints and paintings. 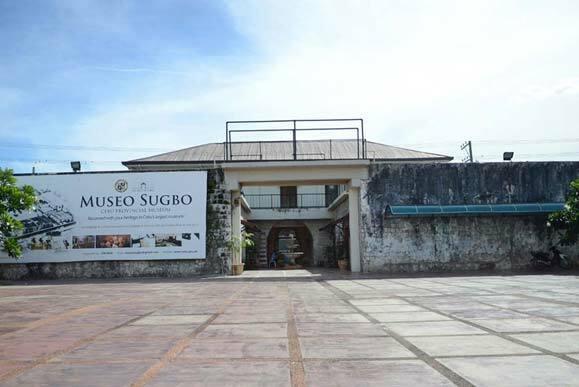 The current location of Museo Sugbo was once the main prison of the Visayas region known as Carcel del Distrito. A prison for the Katipuneros during the Spanish era, a site for incarceration during the Japanese occupation, and reclaimed to what it was known as the Cebu Provincial Detention and Rehabilitation Center (CPDRC); Carcel del Distrito is now a site where the rich history and culture of the Cebuanos may be revisited. Built from limestones in 1738, this fort was used to repel Muslim raiders. 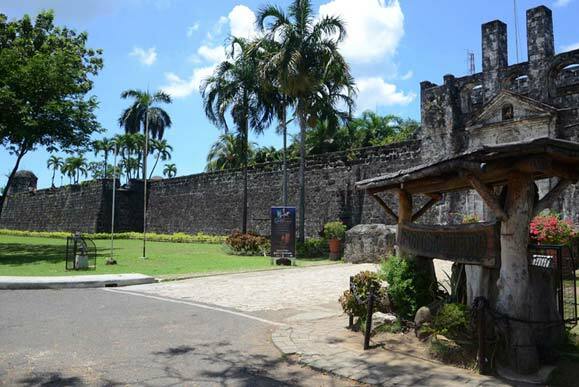 Filipino revolutionaries used the fort as their stronghold, and the US army used it as both a barracks and a prison camp during the Japanese occupation of the country. It also holds artifacts including, porcelains, coins, lockets, sword, cannons, and helmets, among others. The shrine was built in 1866 on the area where Magellan was believed to have been killed in the Battle of Mactan in 1521. 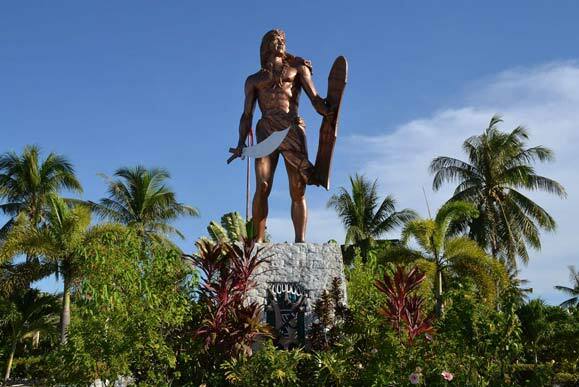 The statue of Lapu-Lapu, the chieftain of Mactan Island, stands 20 meters high and is made of bronze. 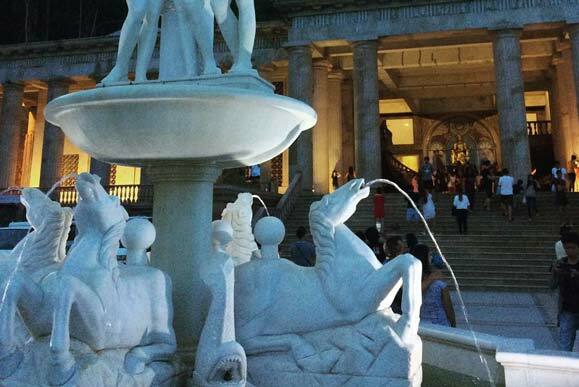 This Greek-inspired building was built in 2012 as a symbol of Teodorico S. Adarna’s undying love and ceaseless devotion to his wife, Leah Villa Albino-Adarna. The temple has an art gallery, museum, and a library where all of the favorite things her wife owned are placed. At the top, there’s a spectacular view of the city and more exceptional scenery as you walk through the temple. In this Greek mythology-inspired 7-story mansion, there are gigantic lions lying on each side of the stairs that will guide you to the doorstep of another jaw-dropping view. You can see a grand staircase with angels made up of brass and the Queen of the Temple in a 10-ft statue with crown and flower. Famous for its vibrant colors of red and yellow celosias that earned the moniker as the “Little Amsterdam of Cebu”. 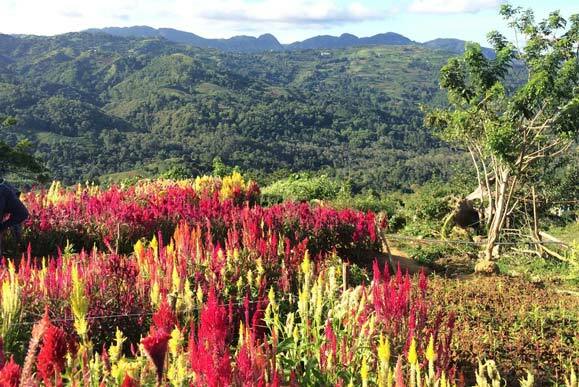 Sirao Flower Farm has attracted a lot of visitors from around the Philippines. With the cold weather in the area; plants like celosia, chrysanthemum, aster, sunflower, and daisy are grown in the farm; making the scenery picture perfect. Approximately six kilometers from the city center in Lahug district lies Beverly Hills, the millionaire quarter of Cebu City. From Cebu City you can get fairly close to the temple by any Lahug jeepney. 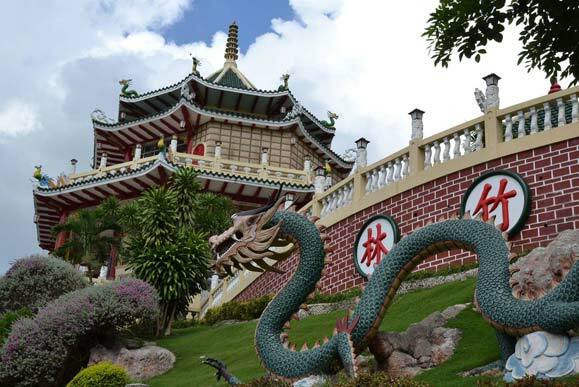 Atop Beverly Hills is the highly photogenic Taoist Temple of Cebu which was built in the second half of the 1900s. 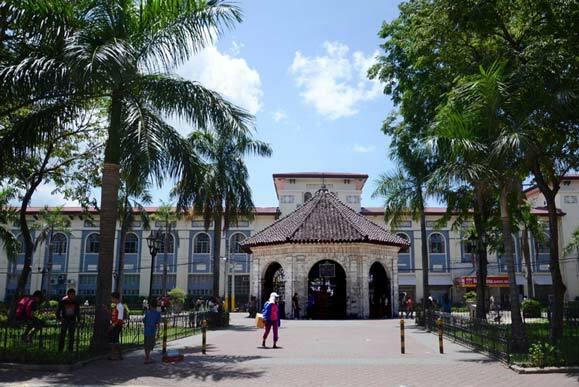 In the heart of uptown Cebu City is a rotunda park with a picturesque fountain in the center. 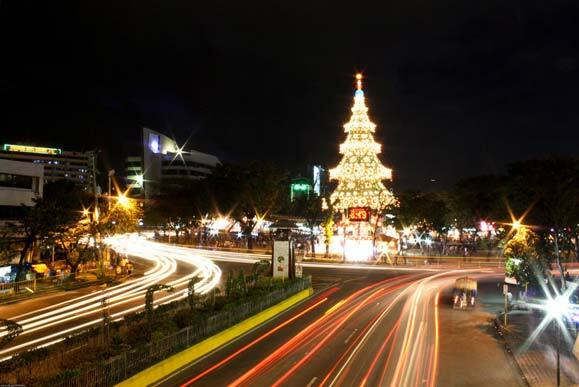 This is the famous Fuente Osmeña Circle, an local landmark for the Queen City of the South. A top Nivel Hills overlooking Cebu City is Tops Lookout, offering a beautiful panoramic view of Cebu City and the surrounding islands (Mactan Island and Olango). 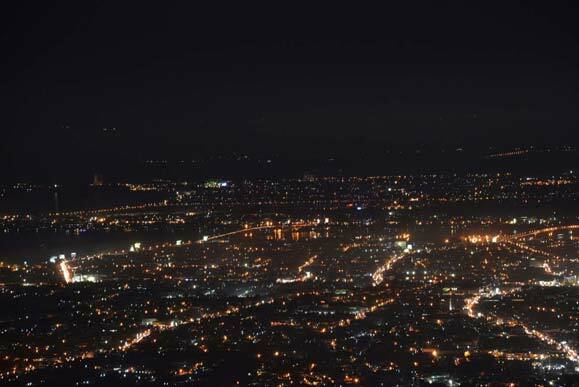 At a height of 610 meters, it’s a great place to visit at sunset and watch Cebu City lights come alive. Not only that, it offers an escape from the city noise, pollution, and heat. The Heritage of Cebu Monument is a tableau of sculptures made of concrete, bronze, brass, and steel showing scenes about events and structures related to the history of Cebu. The construction of the monument began in July 1997 and was finished in December 2000. 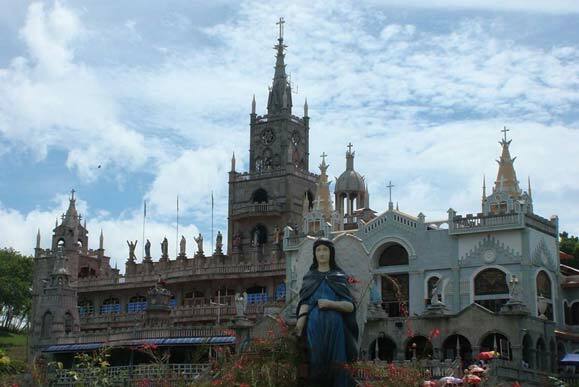 Located in Lindogon, Simala, the Simala Shrine houses the miraculous image of the Blessed Virgin Mary. Before it was built in 1998 by Marian Monks, the area was a farm where the monks planted vegetables and grew animals. When an epidemic hit the area, the monks prayed from the Blessed Virgin Mary for the people to be saved from the epidemic. To honor this miracle, the monks started to build a church, which now resembles a castle where thousands of devotees visit. 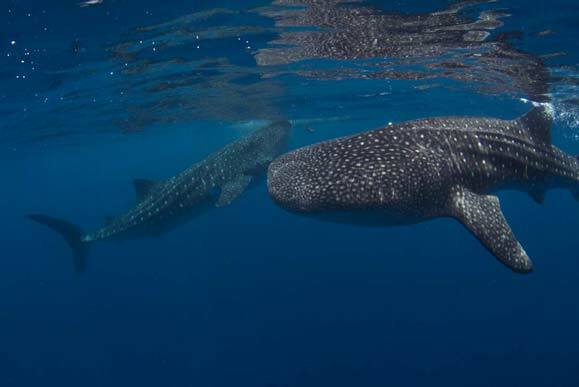 The encounter with the gentle giants started in 2011 in a town 10 kilometers away from the center of Oslob. Visitors come to feed the whale sharks and swim with them. 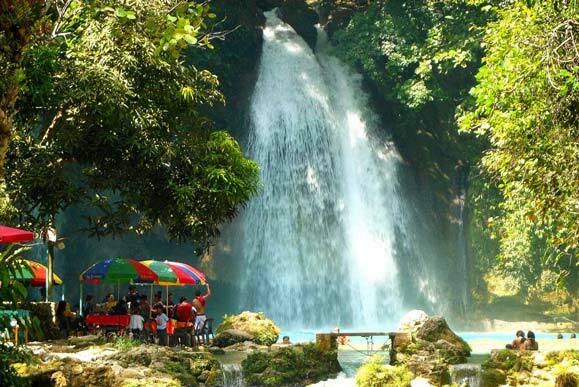 This three-tiered falls in Badian is one of the favorite destinations of tourists when travelling southern Cebu. A 30-minute trek will lead you to the third falls, a petite, picturesque scenery. A few minutes more and you can reach the second and first falls, which have deeper waters. 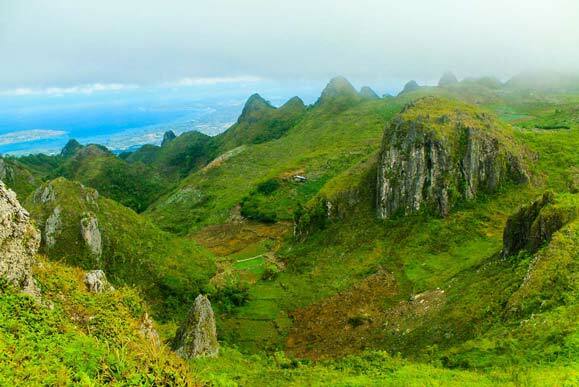 Distinguished by its jagged, sharp peaks, Osmeña Peak is a must-go trail for aspiring trekkers as it is said to have one of the easiest terrains. It also bears a resemblance to Bohol’s famed Chocolate Hills. With a peak at 1,013 MASL, Osmeña Peak overlooks the shorelines of Dalaguete and Badian. 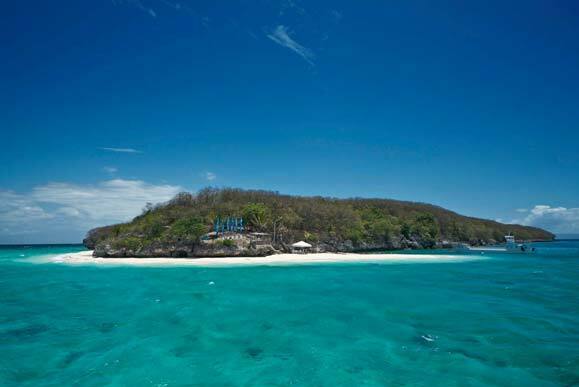 Sumilon Island’s main attraction is its shifting sandbar that depends on the tide. Sumilon Island is a 24-hectare coral island that has its own lagoon, 19th century historical baluarte (watch tower) and has one of the most attractive diving spots popular among divers and enthusiasts. 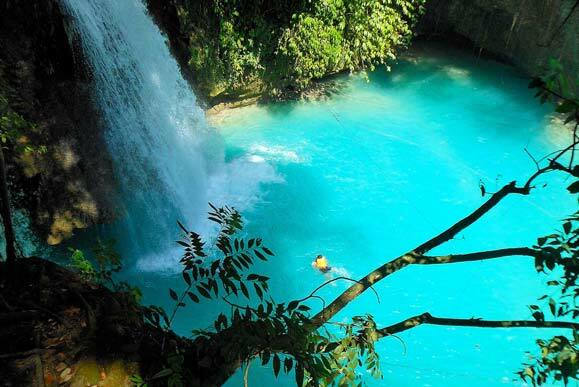 A high-intensity outdoor activity, canyoneering at Badian is an exciting experience following the trails to Kawasan Falls. This six-hour activity involves walking, jumping, and climbing steep terrains. One Central Hotel is downtown Cebu's premier business hotel, offering affordable luxury accommodations. The hotel is managed by Bluewater Hospitality, best known for its homegrown and wholly-Filipino owned chain of resort hotels in the Visayas and Mindanao. Copyright © 2017 One Central Hotel. All rights reserved.